The Company has completed its successful drill programme at Bluebird. Latest results are now available and include 23m @ 5.5 g/t, 16m @ 2 g/t, 10m @ 2.3 g/t, 9m @ 7.9 g/t, 7m @ 4.9 g/t, 6m @ 4.3 g/t, 5m @ 11.2 g/t, 5m @ 5.6 g/t 4m @ 5.2 g/t, 3m @ 6.9 g/t and 2m @ 29.3 g/t gold. The Company has received encouraging results from metallurgical testwork carried out on representative samples of the Prohibition ore body. 23m @ 5.48 g/t Au; 16m @ 1.99 g/t Au; 7m @ 1.67 g/t Au; 4m @ 5.2 g/t Au and in the same hole 3m @ 6.96 g/t Au; 4m @ 3.22 g/t Au; 1m @ 16.34 g/t Au from the Bluebird North lodes. 9m @ 7.92 g/t Au and the same hole 5m @ 11.26 g/t Au; 7m @ 2.47 g/t Au and in the same hole 3m @ 5.94 g/t Au; 6m @ 2.09 g/t Au and in the same hole 6m @ 2.07 g/t Au; 5m @ 5.65 g/t Au and in the same hole 3m @ 3.85 g/t Au; 5m @ 2.17 g/t Au; 4m @ 4.51 g/t Au; 2m @ 29.32 g/t Au on the central Bluebird lodes. 6m @ 4.32 g/t Au; 1m @ 4.33 g/t Au on the Polar Star structure, to the south east of Bluebird. 10m @ 2.36 g/t Au; 7m @ 4.9 g/t Au within the Edin Hope alteration zone, to the south west of Bluebird. Drilling is targeted at increasing the Bluebird resource currently defined as 5,280,000 tonnes @ 1.9 g/t Au for 326,000 ounces. The bulk of these ounces is contained within five high grade domains, 1,698,000 tonnes @ 4.5 g/t Au for 244,000 ounces, surrounded by a lower grade alteration halo. Additional structures within 500m of Bluebird that are being targeted include Edin Hope (south west of Bluebird), Polar Star (south east of Bluebird), and Bluebird North. Of particular significance was the 2m @ 29.32 g/t Au which is about 40m down dip of a previously reported 8m @ 11.1 g/t Au intersection. These results confirm the extension of high-grade gold mineralisation immediately north of Bluebird, in the gap between the Bluebird and Bluebird North pits. Complete results on mineralised zones are being digitised and a new resource evaluation has commenced. The resource statement will be a critical element of mine optimisation and evaluation for profitable and sustainable production. To the south of Bluebird, results include 10m @ 2.36 g/t Au. There is potential for this to be part of a previously undetected fault off-set of the Edin Hope zone. Further work will test this theory. Additional drilling will be planned based on a re-assessment of all of the southern Bluebird lodes in the position of the South Junction pit. This work will continue as a priority to determine if any mining potential exists. A metallurgical test hole has been drilled at the northern end of the Bluebird mineralisation. The Company has acquired the use of three additional drill rigs, bringing the total on site to five rigs. Diamond core drilling has commenced at Prohibition and Vivian-Consols where the company has a programme of 7,000m which follows up the earlier drill results of 7m @ 6.5 g/t, 69m @ 3.5 g/t, 46m @ 1.9 g/t and 28m @ 6.9 g/t all in the same hole. Prohibition has a current resource of 2.3Mt @ 3.6 g/t for 270,000oz and the adjacent Vivian-Consols 0.9Mt @ 7.4 g/t for 234,000oz. RC drilling continues at Prohibition, Vivian-Consols and Surprise. At Surprise the Company has a programme of 6,000m of drilling comprising mostly RC designed to test the grade on cross-cutting faults with an aim of increasing the grade at Surprise. The third additional rig is capable of conversion between rotary air blast and aircore and has commenced a 5,000m programme at Twelve Mile Well 6km south west of Bluebird. The structural target at Twelve Mile Well is the north extension of the fault that hosts gold at Caledonian and Aladdin open pits, where that fault again passes through banded-iron formation. All mineralisation intervals quoted in this press release are “down-hole”. In early May 2006 a pre-planned diamond drill hole was designed to intersect the mineralised ore zones of the Prohibition orebody to provide 300 kilograms of a representative sample for metallurgical test-work. Previous reports referred to possible refractory aspects of the sulphide component of the ore horizons. A metallurgical test-work programme and engineering study is currently underway to evaluate possible processing routes for treating the semi-refractory Prohibition sulphide ore. The work has been split up into two notional stages to enable exploratory work to done on small sub samples in Stage 1, followed by optimisation work in Stage 2. The ore sample assayed 5.10 g/t Au and contained significant coarse gold values. Deleterious compounds and elements are present in only very low amounts. Gravity concentration produced 19% gold recovery to a final cleaned concentrate (suitable for direct smelting). Prohibition ore allows 83% overall gold extraction under standard Carbon In Leach processing methods. Regrinding the concentrate produced by bulk sulphide gravity concentration to 80% passing 15 microns increases gold extraction to 91%. Further treatment using alkaline oxidative methods increase gold extraction to 94%. Stage 1 has clearly defined the need to produce a gravity concentrate which is neither capital nor operating cost prohibitive and delivers a 91% gold recovery. The focus on Stage 2 will determine the operating parameters for alkali treatment of the sulphide concentrate fraction. As this concentrate fraction is relatively small, capital and operating costs are not considered prohibitive and have the potential to lift overall recovery to 94%. 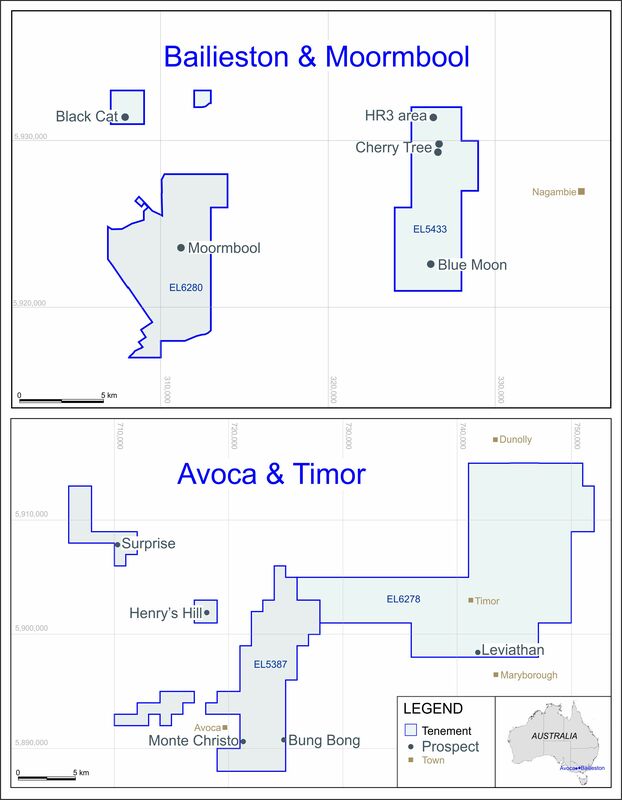 “The Bluebird resource estimate is now underway and the company expects to see a substantial upgrade in the total number of resource ounces. We are now ready to consider the economics of an open pit mine at Bluebird. Julian Vearncombe (BSc (Hons), PhD, FGS, RPGeo, FAIG) is a Director of the Company and consents to the inclusion of the exploration information in the form and context in which it appears here. Julian Vearncombe is a Competent Person for the reporting of these results as defined by the JORC Code 2004 Edition. The Prohibition metallurgical testing was managed by Mr Denis Geldard (Mining Engineer AWASM) the Company’s Operations Director who has over thirty years in mining and metallurgy experience in Australia and internationally and who consents to the release of this information in the format presented here.